The growth and profitability of UK SMEs trading internationally could be derailed by exchange rate volatility ahead of the UK’s referendum on its EU membership, according to the latest research by currency experts World First. ‘Currency confusion’ is also leaving many businesses dangerously exposed to this year’s likely currency volatility due to a lack of preparedness and a knowledge gap. The survey of over 1,000 senior decision makers at UK-based SMEs making cross-border payments found that despite 75% fearing that currency volatility from the EU referendum will impact their business, almost half (47%) are failing to take any notice of foreign exchange markets and over a third (35%) believe that having a currency strategy is not important. The research also revealed the extent to which UK SMEs remain dangerously exposed to currency fluctuations with 45% admitting they have been caught out by a sudden movement in exchange rates and 26% having been severely impacted by market volatility. The findings also highlighted a stark lack of appreciation on how exchange rate movements impact their business with 43% admitting they did not fully understand this and half (51%) that currency markets ‘scare’ them. Despite this, 78% recognised that having a proper currency strategy could improve profitability suggesting that for many SMEs, currency confusion and a failure to effectively manage their FX exposure is impacting the bottom line. According to World First’s own data, the average UK SME trading overseas made international transfers to the value of £256,700 last year, meaning that the nation’s 304,200  SME importers and exporters – or ‘mini-multinationals’ – would have made an estimated total of £78bn in international payments in 2015. This clearly sets into context the need for businesses to better manage their currency exposure to protect themselves in what is set to be a volatile 2016, given increasing uncertainly around the UK’s membership of the EU and the prospect of further interest rate rises by the Federal Reserve and a slowdown in China amongst other threats. “2015 was one of the most unpredictable years in currency market history and there is little reason to expect change in 2016. 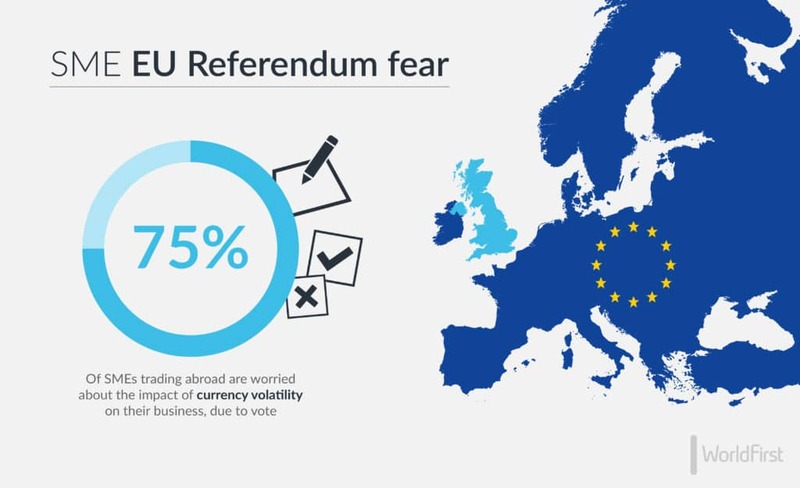 With the EU Referendum hanging like an economic Sword of Damocles, there is an enormous degree of uncertainty and concern in markets and therefore it’s crucial that any business operating internationally has a clear strategy for managing their currency exposure. “Given that SMEs are the engine-room of the UK economy and key to our international trade, more needs to be done to ensure they are adequately protected from currency swings caused by events such as the EU Referendum. Specifically, whilst there is a lack of clarity about the exact timings of the EU Referendum, SMEs should take the initiative now to help mitigate against the risks of currency volatility that we’ll likely see in the run up to the eventual day votes are cast. The survey also revealed that the Euro (54%) was by far the most common currency the UK’s SMEs buy when transferring from Sterling, followed by the US Dollar (32%), the Australian Dollar (2.3%) and the Chinese Renminbi (1.7%). 1,006 senior decision makers at UK SMEs with foreign exchange needs were interviewed between 30th November and 3rd December 2015 by Censuswide. The cost to businesses was calculated by using average number of transactions and average amount, set against World First data for cost of hedged and unhedged transfers across 2015. World First data, YTD average value based on a sample of 3,874 UK-based SMEs.